Whole Foods' growth is still wilting. Same-store sales for the health food giant turned negative 0.2% last quarter, the company said Wednesday. "We recognize the need to move faster and go deeper to rebuild traffic and sales and create a solid foundation for long-term profitable growth," said co-CEO Walter Rob. Changes in same-store sales are a key sign of a health for retailers like Whole Foods (WFM). But the numbers aren't expected to look much better over the next year. The company forcasted same-store sales to grow by a maximum of 2.8%, but could stay flat in 2016 fiscal year. That's compared to 2.5% growth in the 2015 fiscal year. Whole Foods also plans to borrow up to $1 billion in the next few months primarily to buy back stock from its investors, which is typically a sign of trouble. The chain's executives told investors they want to take advantage of low interest rates and said they're "very confident" in the company's ability to repay the loans. 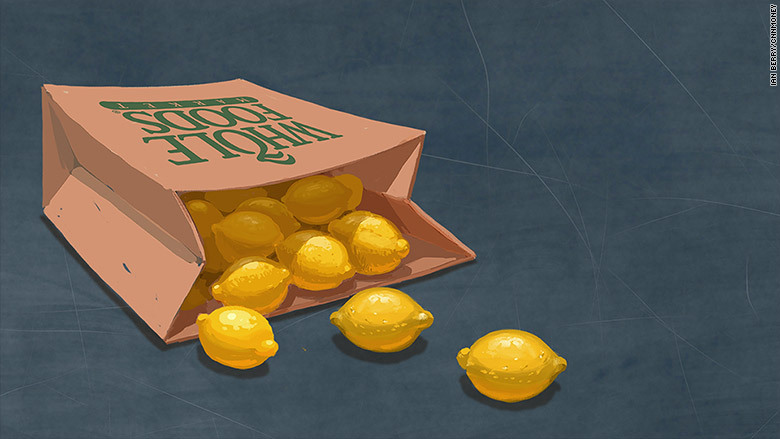 Whole Foods has waded through hard times for more than a year now. Mainstream chains are eating into its market share by stocking their own natural and organic products which are often cheaper. Co-CEO John Mackey said Whole Foods is ramping up its marketing. He said the company will stay competitive because it offers food quality others don't. Its latest sales report left investors even more soured on Whole Foods stock. Shares plunged more than 7% Wednesday evening, and it was already down more than 30% so far this year.